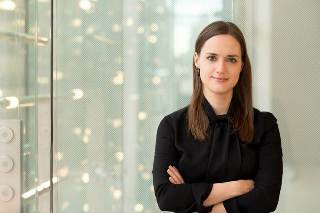 Opportunity beckoned to Dina Gilbert, the dynamic 31-year-old assistant conductor of the Orchestre symphonique de Montréal (OSM) this week when scheduled guest conductor Alain Altinoglu cancelled his appearances due to ill health. Gilbert, whose three-year tenure with the OSM ends this summer, opened Wednesday’s concert with impressive handling of three miniature works commissioned by the orchestra from Canadian composers in 2013. Each took inspiration from a 20th century Canadian painting (photos of which appeared in the program)—not necessarily as programmatic content for the music, but rather as points of departure in emotional terms, much as Holst did for his Planets. Gravité, by Simon Bertrand (born 1969), is based on a painting by Jean-Paul Riopelle (Canada’s answer to Jackson Pollock). It is, according to the program notes, “a cross between Messiaen and Dutilleux on the one hand and the American minimalism of John Adams on the other.” One might wonder what is Canadian about that. In the event, it succeeds in living up to, if not the work, at least its title. Using a wide palette of deep, sonorous colors, Bertrand created a captivating, inspirational tableau of emotional depth and gravitas. Scott Good (born 1972) took as inspiration for Evening, North Shore, Lake Superior a work by the Group of Seven artist Franklin Carmichael. Good evoked visions of a desolate, decaying wasteland aided by repetitive chord passages from the winds, shimmering tremolos from the cymbals and mournful glissandos from the harps. Betty Goodwin’s “Nerves, No. 10” provided the inspiration for Moving, Still by Jeffrey Ryan (born 1962). As his title suggests, the work expresses dualities of fragility and strength, surface and depth, individuality and collectivity. These qualities are expressed in sound, according to Ryan: “layer upon layer, color upon color, tempo upon tempo, the sustained tones of a single large chord enclosing constant activity.” The sensation induced was indeed schizophrenic! All three compositions, of about four to five minutes each, require a large orchestra and Gilbert proved her mettle in controlling and shaping the ensemble to evoke the complex rhythms, colors and shifting tempos demanded by the works. All sections of the orchestra were in top form, including the percussion which provided plenty of unusual and at times cacophonic sounds, and the brass which turned out several nicely burnished, fluid passages. Almost as impressive was the performance of Holst’s Planets. Again, the sound was big—at times almost overwhelming—but rather raw and brash. The brass in general were not as polished as earlier. Gilbert, however, produced well-shaped phrasing, even tempos and tight rhythms, and provided smooth transitions between the louder and softer passages. The off-stage women’s choir at the end of “Neptune” sounded appropriately ethereal as their diminishing sound led the listener into further reaches of the universe. Jan Vogler’s performance of Elgar’s Cello Concerto was abominable. Those who are familiar with Jacqueline du Pré’s 1965 recording would have cringed at the delicate, wispy opening chords, which the composer notated not only as double forte but also with accents. It was all downhill from there. Vogler’s playing lacked passion, intensity, expressiveness and depth. It was as if he were playing a delicate Classical piece for elevator music or for a light, romantic film. Instead of providing adequate support the orchestra sometimes drowned him out, and during the orchestral solo passages pulled out all the stops as if warming up for The Planets. A welcome touch to the evening was a 30-minute organ pre-concert by Rachel Mahon, Organ Scholar at St. Paul’s Cathedral, London. She also performed 20th Century British works. Composers included Sir Charles Villiers Stanford, Percy Whitlock, Herbert Howells and Sir C. Hubert Hastings Parry. She played with an even tone, close attention to detail and a confident command of the hall’s great Casavant organ.